Happy Sunday everyone! I just want to let you guys know that I saw Sato Meiko at a mini-live last week. I wrote a semi-detailed report on it on the Japanese pop site Arama! Japan. These are the wishes made by Sato Mieko, a singer-songwriter who recently promoted her newly released Triple A-side “Mou Chotto / Kimi wa Mahoutsukai / Kaze ni Natta Anata e” at a free mini-live in front of Nagoya’s Parco on January 7th. 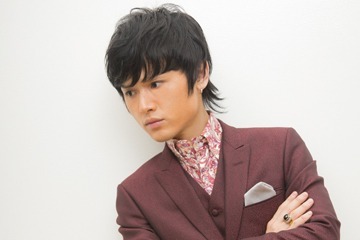 Sato is no stranger to the Nagoya music scene. She originally started her music career as a singer-songwriter under the pen name “Fuuka Koyoi”, releasing only one single in 2007. She then went on to join the mega-idol group SKE48 in 2008 as a member of Team S. There, she regularly performed with her fellow members on the local SKE48 stage or on stages in front of thousands around the country. She left SKE48 in 2015 to continue her dream of being a singer-songwriter. The musician went on to release a single in 2015 named “YOUR COLOR” and an album named “Yakusoku” in 2016 under an indies label. She recently released another single, her first triple-A single, on December 21, 2016. However, because of the holiday season, she couldn’t promote until January 7 when she appeared at Parco in Nagoya’s Sakae shopping district. What comes to mind when you think of this fabulous season? Is it the beach? The heat? The heaps of ice cream you get to eat? Whatever may be the case, as we head towards winter, you are probably missing those dog days of summer. HR can help by reminding you of those feelings with their debut single “Natsuiro Candy” (Summer-Colored Candy). HR, short for Hakata Reboot, is an enormous idol group based in Hakata, Fukuoka Prefecture aka southern Japan. The group formed in 2010 with fourteen members with a simple motive; be an AKB48-like group for girls who want to become idols but can’t move to Tokyo. It sounds a bit fishy but plausible because, despite Japan looking like a tiny country on international news reports, the distance between Tokyo and Fukuoka is over five hundred kilometers (or over three hundred miles). That might or might not seem a lot. But, a hopeful idol who wants to make it big in the idol industry, it is. Trying to keep their dreams alive, HR opened their own theater on the third floor of Box Town Hakozaki. Interestingly, a sister group of AKB48 performs in another theater near HR. Selective girls perform on Saturdays, Sundays, and holidays, which are the days that HKT48 closes their theaters in order to have members do promotional work all over Japan. Smart thinking, HR managers! The group constantly adds members with countless auditions they hold throughout the year. And, like all mainstream idol groups, members graduate or leave the group. However, I feel like members in HR leave faster compare to other indie/not-so-popular idol groups due to the prospect of other, well-known, Fukuoka-based groups like LinQ and HKT48. If you take a look at HR’s Japanese Wikipedia page, there are more graduated members listed than active members. That is a bit surprising. Nevertheless, the group persisted and released their debut indies single “Kimi ni Spark” on May 2, 2012. Three years later, they released their debut major single “Natsuiro Candy” on June 24 under the Columbia Records label. To promote the single, the group split up into “teams” and did various promotional store events across the country. I decided to go see HR at Nagoya’s Kintetsu Passe before I went to see ANGERME at another mall because I wanted to kill some time. Like most of the groups I mention on this blog, I didn’t know about HR before I saw the mini-live. I actually briefly saw the music video for “Natsuiro Candy” and wasn’t impress. Seriously, the music video is basically having is girls dancing and singing in bikinis on some beach, I thought it was unflattering, boring, and a blatant ripoff of AKB48’s bikini fest music videos. I arrived at Kintetsu Passe five minutes before the event started. There were a small number of male fans starting to queue their place in the event space. By the edge of the area, members were circling around, chatting with fans and non-fans while promoting the event to people passing by. No really approached me and tried to start a conversation with me sadly. I was a little disappointed because I was hoping that someone would want to strike a conversation with me. Maybe they were afraid to or that there wasn’t enough time to chat. Once it was one o’clock, the members headed towards the stage and began to sing their opening number. I don’t remember which song they sang. But, I stuck around for three songs before I had to catch a bus to see ANGERME. I can’t recall what songs they song, what was their opening talk about, and can’t seem find a set list anywhere on the web. HR isn’t my cup of tea since, like I mentioned above, their music videos and songs are an obvious ripoff of famous AKB48 summer songs like “Labrador Retriever” and “Sayonara Crawl”. Although they are AKB48’s most popular singles, I find them to be bland and tasteless as they feature simple vocals and basic instrumentation. Though “Labrador Retriever” has somewhat of a plot going through the music video, the primary focus is on the girls doing a plain choreographed dance in their bikinis. Maybe I am looking at these summer songs at the wrong angle but I don’t find them interesting at all. I am more of a “RIVER” and “Halloween Night”-type of fan. In the same regards, that is how I feel about HR and “Natsuiro Candy”. The girls are pretty nice, cute, and ambitious. But, their songs are a snooze fest. There is no personality or taste in both the song and the music video. I understand that this is their debut single and they probably didn’t get a lot of money to get a great song or music video. But, for the love of all things good, put that money to good use by making something diverse. We don’t need ANOTHER AKB48-sounding group! I would recommend HR if you like the 48 family or knock-off groups like Idol Kyoushitsu. If you aren’t, you could still enjoy them since they are pretty cute and have a feel good attitude. However, don’t expect too much as “Natsuiro Candy” isn’t much of a memorable song. HR just needs time to find their sound as they should stop copying a popular idol pattern and do their own thing. They will release their second single, “Toy Soldier”, this Wednesday. It’s much better their debut single but still copying that bland idol formula. Fun Fact: HR’s image color is “Mentaiko pink”. Mentaiko is marinated fish eggs from pollacks and cods. It is part of the Japanese cuisine. The group’s hometown of Hakata is famous for “spicy Mentaiko”. Thus, the group’s image color pays homage to their hometown dish. I finally can finish writing up all the in-store live events for May! I swear May was one of my busiest month in terms of attending events. 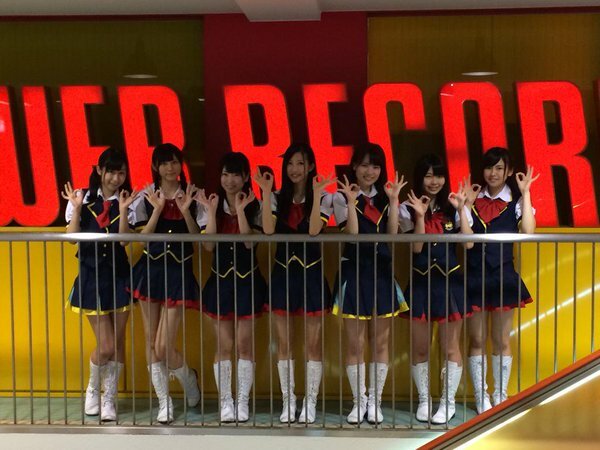 Nevertheless, the last in-store event of May was for the idol group GIRLS4EVER at the Tower Records in Nagoya’s Kintetsu Passe. The group is made up of four members; the sweet Airi, the “hip” Rico, the beautiful Japanese and French Sakura, and cute and energetic Aika. The group is fairly new as they made their debut at a live event in Akibahara last year. That same year, they also released their debut single, “The Girl of Fate / LOVE&TRAIN”. For this time around, the group was doing in-store lives to promote their new single “Down the Line”, which was released at the end of April 2015. 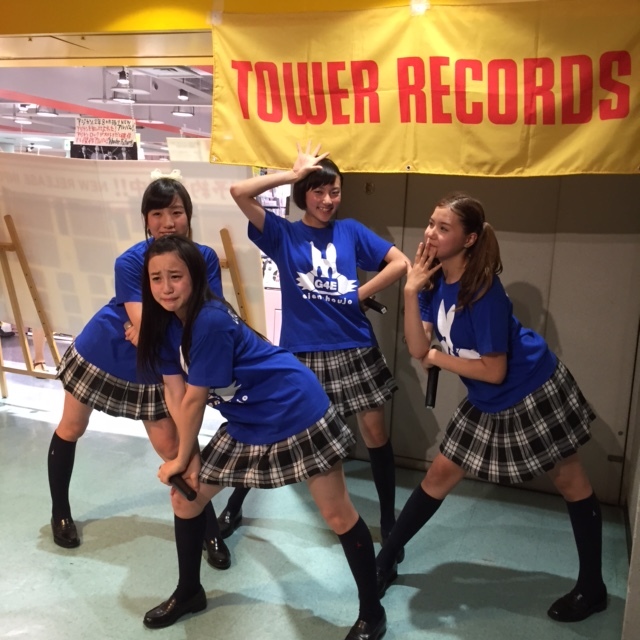 I checked out their new single via Youtube after I discovered that they were coming to Tower Records. I was on the fence about going as I thought “Hey, they don’t seem so bad. Maybe I should check them out” one day and then “I don’t know, maybe I shouldn’t go” the other. A Facebook friend of mine named Peter, who this post is dedicated to, helped me get out from this rut as he recommended me to go. I went to the store fifteen minutes before the live was scheduled to start. I got a spot near the stage pretty easily as there wasn’t a lot of people in the event space. But, as I put my stuff down and settled in, I noticed that there was an array of cameras all around me. Why is the guy next to me holding a professional camera? The common sense rule of idol events is that there is NO picture-taking whatsoever. These were the thoughts that were running though my head. I was so confused. Luckily, the host of the event explained a few minutes later that it was ok to take photos. Relieved, I whipped out my iPhone and stood to the side to get ready to take a lot of photos. 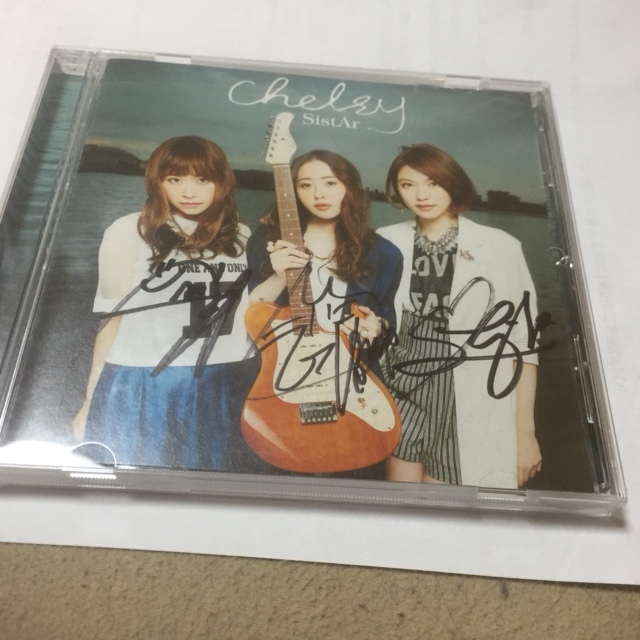 After the live, I decided to buy two singles so I could shake the girls’ hands and take a photo with one of the members. During the in-between time, I joined the line for the handshake event. I was one of the first people to get into the line. The first person who I came up to was Airi. Our conversation was basically thanking each other for today, where I was from, and other little things. It was a very quiet and short conversation. After Airi, I went to Aika next and boy, did things change. Aika is verrrrrrrrrrrrrry energetic and chatting. She asked where I was from. And, when I said I was from America/United States, she tried to speak English. Although, she told me in Japanese that she wasn’t very good. She was very cute and so bubbly. Too bad I had to go to the next girl, I would have like to stayed and talked to her forever because she is such a chatterbox. Next girl I approached was the hip leader Rico. She was coolm and collected as we talked about basic things. Our conversation was very short too; maybe because I didn’t have much interest in Rico (and also Airi). Then finally, I was reached the final member, Sakura. I first said my “hello”s and “thank you”s. Then, she told me that she is part French and knows some English and French. I told her that I can’t speak any French. 😦 We ended up having a short conversation in English before I had to leave the line. After going through the handshake line, I went to the side of the event area and waited a bit for the next event to start. After a while, the event manager announced that they were ready for the two-shot/photo-taking event. Since I only had two tickets, I could take a picture with one girl. It was between Sakura and Aika, which one should I choose? As you see, I chose Aika because of her funny and bubbly personality. When I came up to take a picture with her, she kept on trying to speak English. She was such a goof. We also talked some more in Japanese as I also try to “teach” her some English. 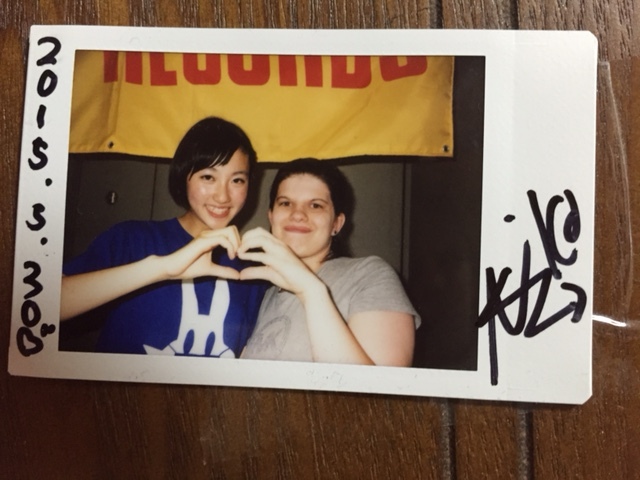 As we were waiting for the photo to dry and for her to sign it, Sakura kept on telling me in English that Aika can’t speak English well. And Aika playfully fought back, saying she could. Haha. I love these kinds of moments. 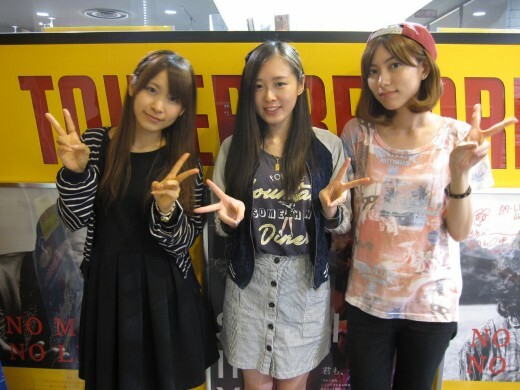 GIRLS4EVER is a typical idol group with ok vocals. However, their personalities make up for the lack of amazing vocal skills. These girls each have their own unique personality that makes this group special. I personality love Aika because of her chatty and bubbly self. But, I wouldn’t mind seeing all four girls again in the future as they are lovely group who loves to have fun.